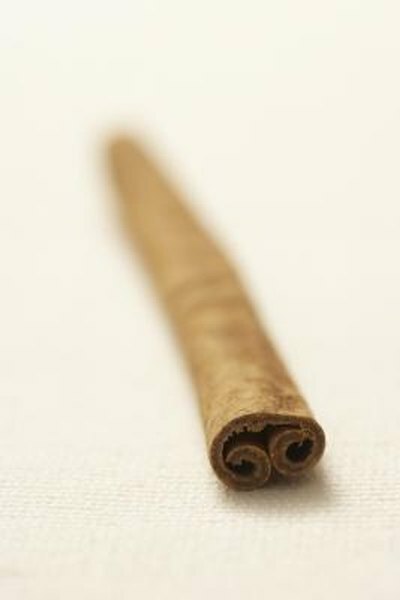 Cinnamon is a spice that comes from the bark of a tree native to Southern Asia. Although it is primarily known in the United States as a spice for pumpkin pie, oatmeal and cookies, this herb also offers healing benefits. Cinnamon bark can be used to make a spicy, fragrant tea to treat several conditions. Check with your physician before using cinnamon tea to treat or prevent any illness or condition. Cinnamon bark contains eugenol, a chemical that might offer antiseptic benefits, according to Castleman. Eugenol can help destroy bacteria and fungi that cause infection and illness. Cinnamon tea might be particularly effective for preventing wound infections caused by fungi and bacteria on the surface of your skin, as well as Candida albicans, the fungus commonly responsible for vaginal yeast infections. The eugenol found in cinnamon tea may also help prevent nausea and stomach pain caused by indigestion, according to certified nutritional consultant Phyllis Balch, author of "Prescription for Nutritional Healing." Cinnamon helps to break down fats from food sources that are difficult for your body to digest. Eugenol may also increase the production of digestive enzymes necessary for preventing indigestion. Drinking a soothing cup of cinnamon tea may help relieve several types of pain. The eugenol in cinnamon tea acts as a natural anesthetic, according to Castleman, and help to relieve abdominal cramps, pain from wounds and rashes and joint pain caused by arthritis and fibromyalgia. Cinnamon tea also helps reduce pain related to toothaches and gum disease. Castleman notes that eugenol may have properties that help to reduce hypertension, or high blood pressure. However, the mechanism for cinnamon's potential effect on blood pressure is not known. Scientific research on the link between eugenol and hypertension is not yet conclusive. Although concentrated cinnamon oil is toxic and might cause nausea, vomiting and kidney damage, cinnamon bark or powder is not considered toxic. The FDA considers cinnamon generally safe, according to Castleman, but heavy consumption of cinnamon tea occasionally might cause diarrhea.